It only takes one stolen laptop, one employee’s USB stick, one hacker, one virus, or one careless error to compromise your company’s reputation and revenue. The threat of data breach is real and it’s critical that your company is prepared. A thorough plan that can be executed quickly is essential to comply with relevant regulations, maintain customer loyalty, protect your brand and get back to business as soon as possible. Download now! 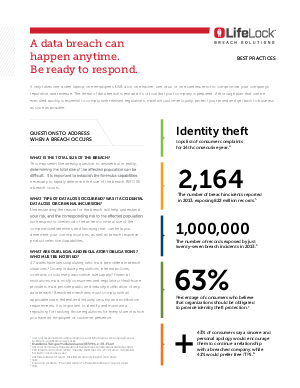 Find out the best practices for handling a data breach and questions your company needs to answer when a breach occurs.